DEN is one of the most successful airports in the United States. Now, it is also home to one of the most visionary commercial communities to emerge in today’s global economy. DEN will help connect businesses to the local metropolis, the region and the world in bold new ways. Our location is at the mid-point between Tokyo and Frankfurt, allowing same day communication between multiple international time zones. DEN’s strategic location facilitates business connections from coast to coast as well as with Europe, South America and Asia. DEN is the 5th busiest commercial airport in the United States and served 61.4 million passengers in 2017. The airport provides nonstop service to more than 205 destinations, including more than 25 international cities. 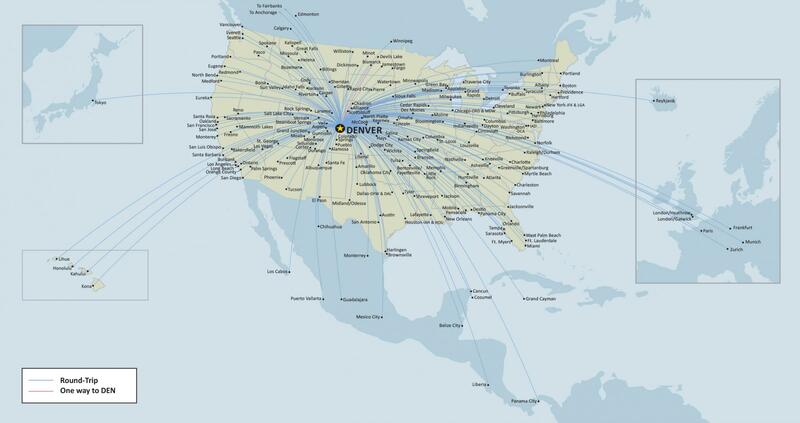 This is the most nonstop service of any airport in the United States. Businesses couldn’t ask for a more vibrant location than Denver, Colorado. Denver is one of the most thriving cities in the nation. Colorado continues to grow and diversify its robust economy. That’s why Fortune 100 firms continue to choose to do business in our metro region. In addition to a wide range of entrepreneurial businesses, Denver is home to ten Fortune 500 headquarters that are equipped with an educated, advanced-degree workforce to support sectors such as technology, healthcare, financial, industrial and agribusiness. With a strong economic base and diverse industry sectors, the Denver Metro Region is well positioned to accommodate and absorb current and future growth into the metro area.